MAPS-2 is the ultimate solution for automatic preparation of materialographic specimens. A modular system which is customized exactly to the user’s specific requirements. MAPS-2 takes care of the entire preparation process ¬– from plane grinding to final polishing – including cleaning and drying. 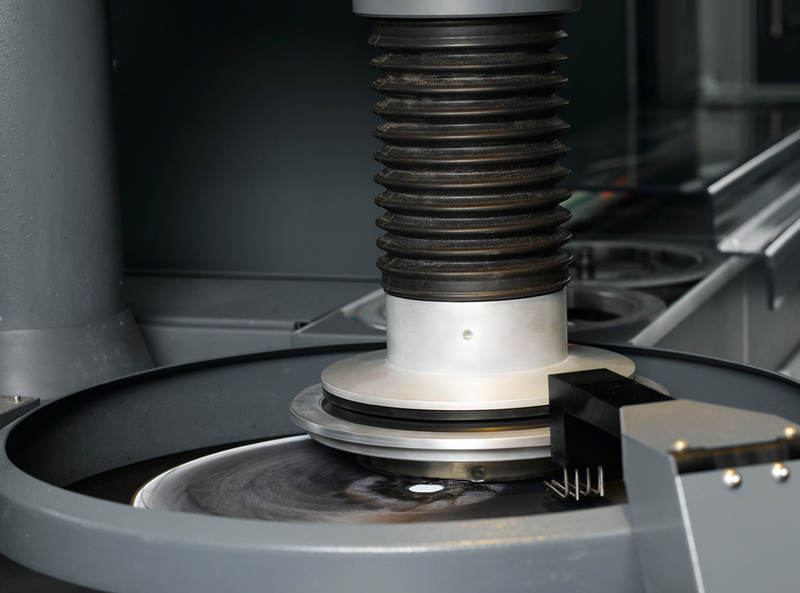 Automation means excellent specimen quality and cost savings due to the precise control of all preparation parameters and consumption of abrasives and lubricants. Reproducibility is second to none. MAPS-2 consists of modules, each with two work stations, one cleaning station, and a specimen holder arm. Accessories such as dosing units, an additional recirculation cooling unit, level indicators for consumables, etc. differ according to the configuration of each MAPS-2 system. Conveyors transport the specimen holders from unit to unit. 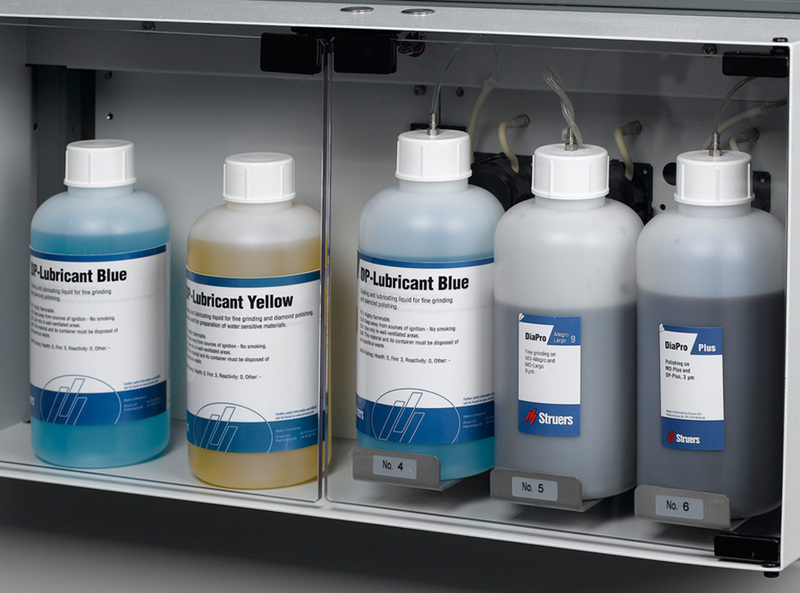 Suspensions and lubricants are stored in easily accessible modules. A steady flow of specimen holders can pass through MAPS-2. While the second module takes care of polishing, the first module is plane grinding the next batch of specimens. A special line function makes it possible to prepare different materials using different preparation methods. The line function ensures an extremely fast throughput and eliminates all bottleneck problems, even at high volume preparation. Fully automated specimen preparation means a steady flow of specimen holders can pass continuously through MAPS-2. A special line function ensures an extremely fast throughput and eliminates all bottleneck problems. 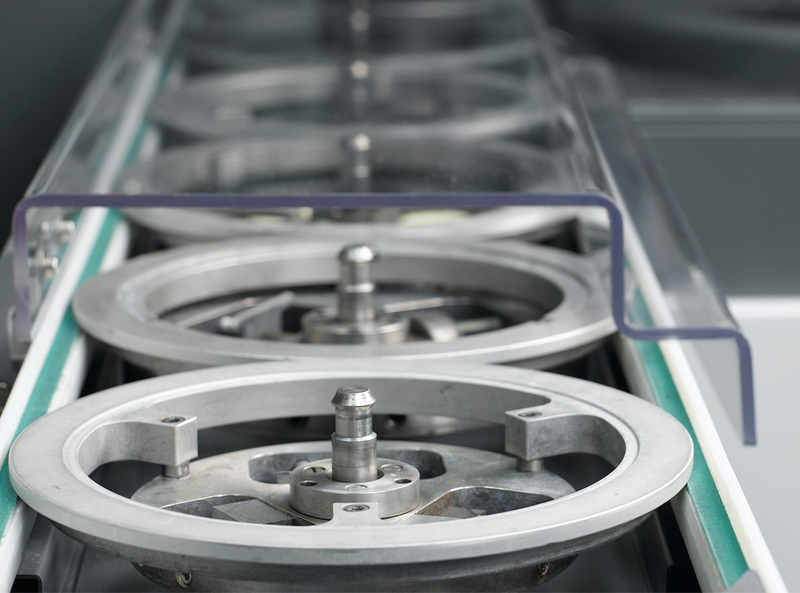 The automated process, independent of the operator, means efficient and correct use of consumables with no waste. Established methods can be recalled immediately from the method database by the operator using the methods window. This ensures reproducibility, regardless of operator changes. No operator intervention is required when the next specimen holder requires the same method as the previous one. MAPS-2 modules can be configured in numerous different ways, depending on the requirements. This is the consequence of modularity taken to its logical extreme: each MAPS-2 system is configured on the basis of a thorough analysis of the user’s specific needs. MAPS-2 can be connected to a local area network and can thus be accessed via the Internet. This enables Struers service engineers to remotely check the condition of MAPS-2 and detect any errors. 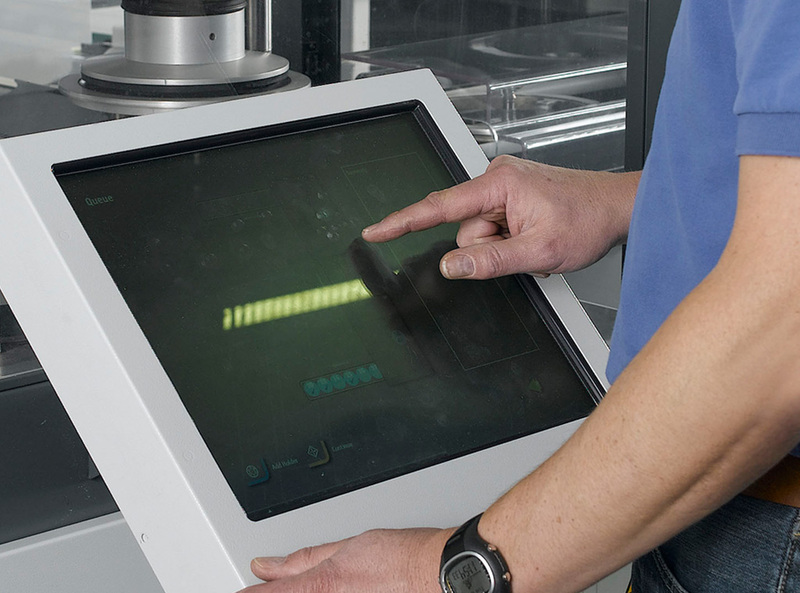 Software updates can also be carried out remotely, reducing machine downtime to an absolute minimum. MAPS-2 takes care of the entire preparation process, even when it comes to the most complex specimens, leaving the operator time for other tasks. In many cases, materialographic preparation has been a bottleneck. MAPS-2 eliminates this problem and leaves plenty of time for the one task which has not yet been satisfactorily automated: microscopic examination and evaluation of a materialographic structure. Automation not only means unique reproducibility and high quality – it also implies large cost savings. The initial cost of automatic equipment is more than counterbalanced by savings in time, labor, and costly diamond abrasives. Precise, automatic control of consumables consumption means that exactly the right amount is used – no more, no less. 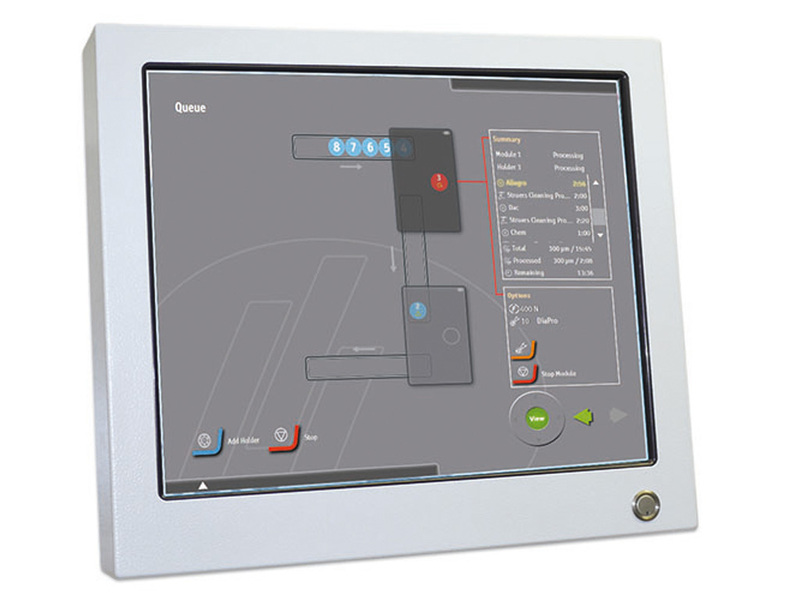 MAPS-2 is programmed and operated from a large touchscreen. A single tap on the screen inserts a new specimen holder. No further action is necessary when the method is the same as the previous one. To select a different method, another tap opens the methods window from where all existing methods can be recalled immediately. New methods can be programmed instantly, and the configuration of the machine can be changed on the fly. The touchscreen can be mounted either on the right- (default) or left-hand side of Module 1. MAPS-2 complies with the strictest international safety standards. The conveyors are equipped with safety covers, and the entire machine is closed with transparent windows and doors. The process can be easily monitored, but access to moving or rotating parts is prohibited. If a specimen happens to be improperly clamped, it cannot fly out of the machine. 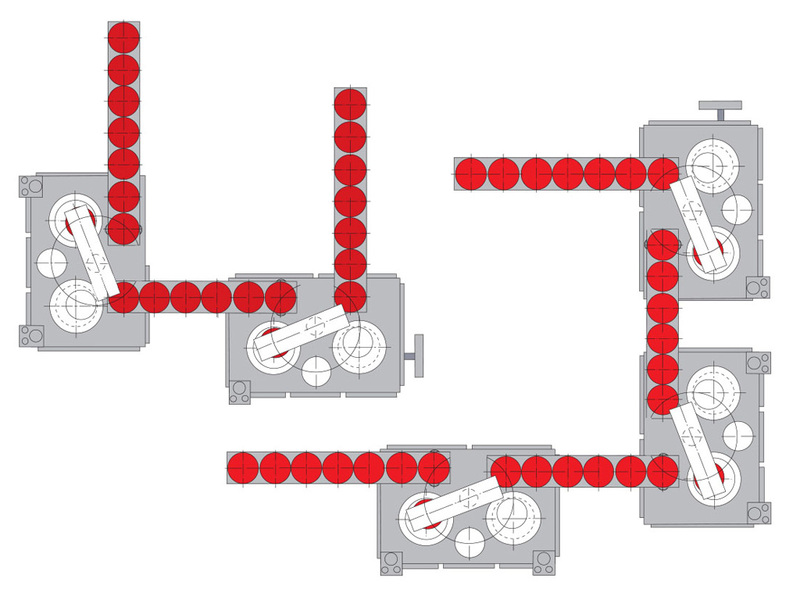 With two fine grinding/polishing stations (150/300 rpm), two Bottle Units and one Dosing System with three DP-pumps, one Dosing System with two DP-pumps, and one OP-pump, and disk cooling. For mounting on a MAPS-2 preparation module, with a safety lid. For mounting on a MAPS-2 preparation module, with a safety lid and a built-in drying fan. To use recirculated water for grinding on a MAPS-2 preparation module with two fine grinding/polishing stations. For connection of two work stations to one recirculation cooling unit. One dosing module with three DP-pumps. One dosing module with two DP-pumps and one OP-pump. For collection of the waste alcohol from the cleaning station.